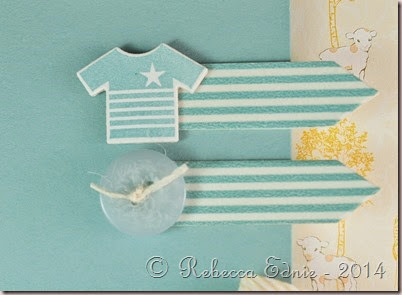 Click the graphic above to visit the blog hop start. Isn’t it a pretty graphic? I love it! I sure hope the colours are accurate on this photo. I had trouble with that on my last post even though I edited it as usual. I used a background stamp I’ve had for so long I have no idea who manufactured it. 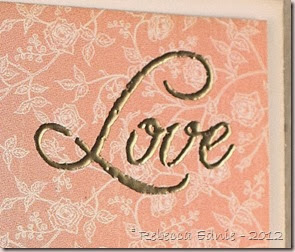 I embossed it with brown EP on water colour paper and then added various inks to ‘watercolour’ it. Then I added the embellishment cluster which includes some cheese cloth. I couldn’t decide what sort of sentiment to use but I finally settled on a thank you. I intend to give this to my girlfriend who is very generous with babysitting when I ask her on a coffee date to thank her. I’m exhausted so I’ll add it later. I’m sad to say this this is my last Unscripted Sketches post as the owners of the blog have decided to move on to other things. I certainly wish them well. So here is my last project. 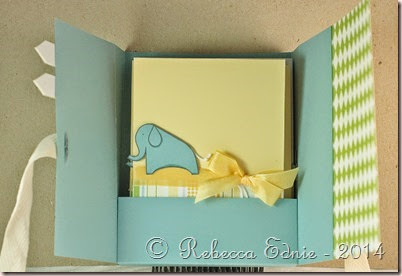 I love this muted aqua, tan, ivory and chocolate combination. 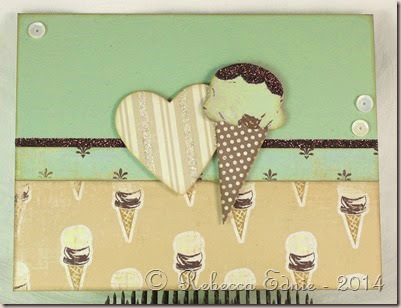 I was stuck for an idea so I started looking at my dies and my eyes settled on my ice cream die. Ah, perfect. 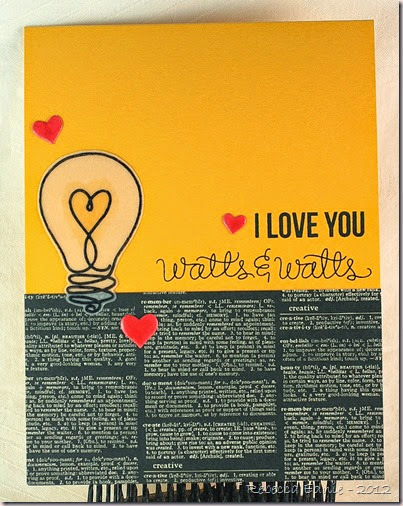 When I pulled out this paper pack for obvious reasons, there was already a die cut heart! Even more perfect! I don’t remember cutting it but why not use it? 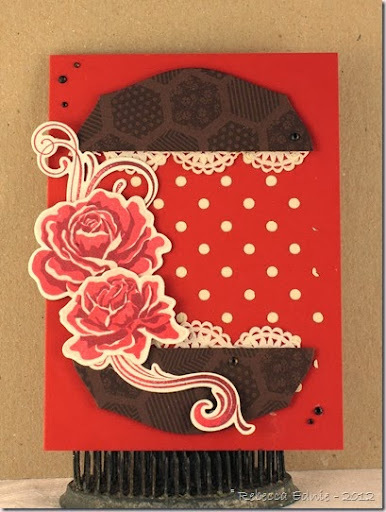 I added glitter to the ice cream cone with a glue pen and to the card with red line tape. 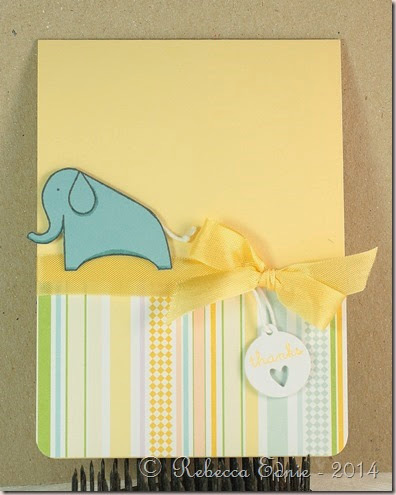 I used the glue pen for the stripes on the heart too. 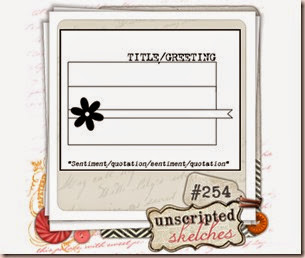 I really hope you will play with Unscripted Sketches one more time this week. I hope we have record numbers of participation for our last hurrah! I’m really sad to see it go. I haven’t been a member long and I so wish this was a long term assignment. I was on design teams before my baby was born but quit quite a long time ago. I didn’t want to work while he was little but I was so ready to start over again. oh well, the search starts again. Have fun! 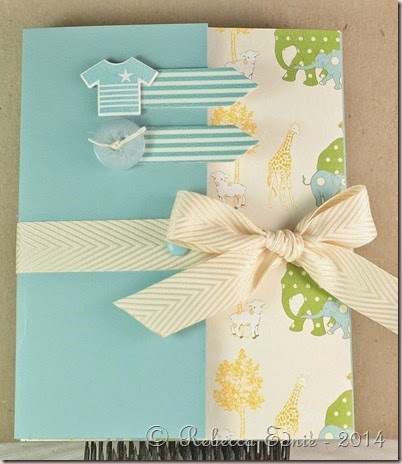 Paper: MME, cardstock base-baja breeze-SU! 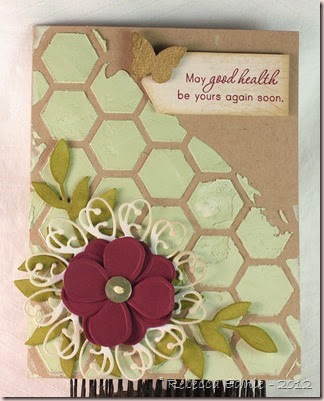 Doesn’t this card remind you of a prairie dress? I love these patterns and colours. 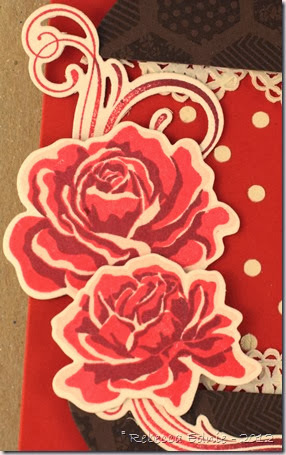 I’ve been wanting to copy the paper piecing technique Melissa Phillips uses for ages. I finally decided it would be perfect with this card. You can see her card here. 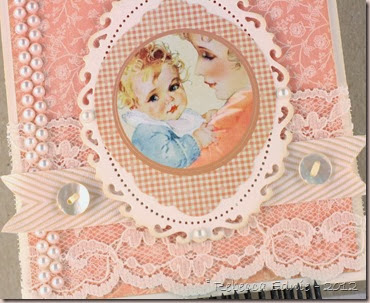 I’m entering this card in the CASE Study DT challenge. 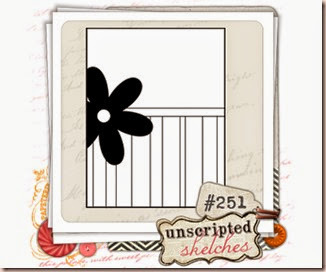 I hope you will join us this week on Unscripted Sketches. I love the ‘sentiment/quote’ part at the bottom. 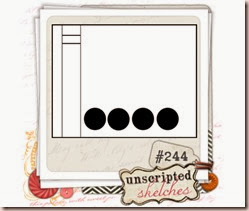 I have tons of tiny stamps I love to stamp repeatedly as a border. What do you have in your stash that would work? ETA: I apologize this didn’t post earlier. For some reason my pre-scheduled post didn’t go up as planned at 8am. So sorry. Congrats on 5 awesome years! 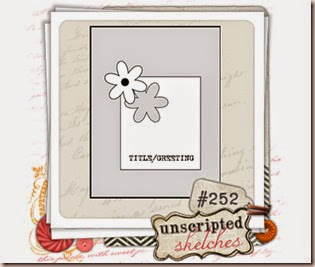 This week we have some special prizes on the Unscripted Sketches blog so be sure to visit right after you read this post. Don’t leave yet though because I have blog candy here too! But first up is my card. 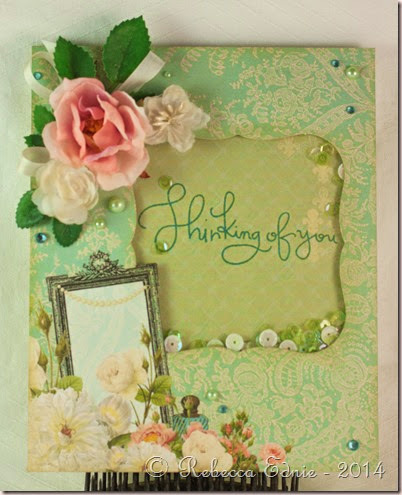 A friend is going through a rough time so I thought I’d send her a Thinking of You card. I dug out these older, gorgeous Webster’s Pages papers and I’m so glad I did. I cut the mirror on the bottom left with an X-acto before I die cut the label shape so I could exclude it. If you’ve never done this technique before, you just cut the part you want to exclude carefully then tuck the die underneath. I used leftover Spellbinders packaging to create the window for my shaker. I really should make shakers more often, they are so much fun! You can see the sequins inside but it also has microbeads that you can’t see as well. 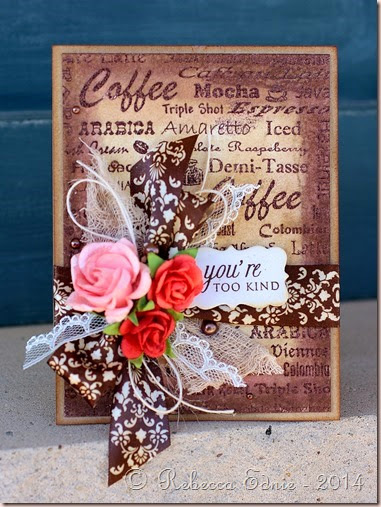 So, now the moment you’ve been waiting for… I am offering blog candy! I’ve been making lots of jewelry lately so I am offering a silver bar necklace like the one above, with your choice of colour of crystal or stone (from the colours I have). I will contact the winner to find out more about their preferences. So, what do you have to do to enter? It’s easy. 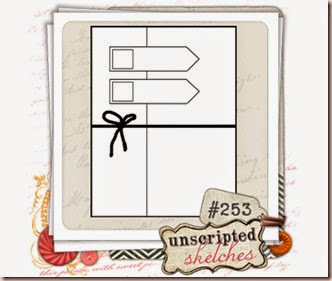 Sign up for my email updates (over on the sidebar), leave me a comment saying you signed up AND enter to win at Unscripted Sketches. You can enter by commenting or entering a card or both but if you enter a card, you may come back and leave another comment saying you did so for another chance to win! If the winner I pick hasn’t entered at Unscripted Sketches, I will choose again. I will pick the winner next Saturday and she will have 48 hours to reply. I hope you all enjoy the festivities, other designers are offering blog candy too so be sure to visit all of them. I hope you love this week’s sketch, I thought it was super fun. I had to think really hard about this sketch because, as you know, I like to go outside the box. I was thinking about going with pinked-edge squares and doing a quilt theme but it didn’t suit me this time. But I am really into using my homemade texture paste! And I love colouring it! This time I used Copic ink either G21 or 24, I don’t remember which. It takes more than you’d think to get a decent amount of colour since the colours are soft. I tried making the butterfly yellow but didn’t like it so coloured over it with a gold paint marker. Perfect! I just picked a random sentiment but turns out a friend is sick so it was a great choice. 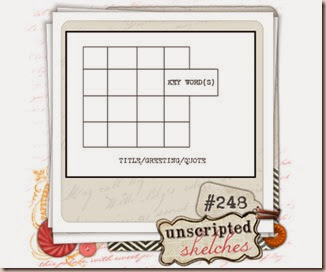 I hope you will play along with us this week at Unscripted Sketches! 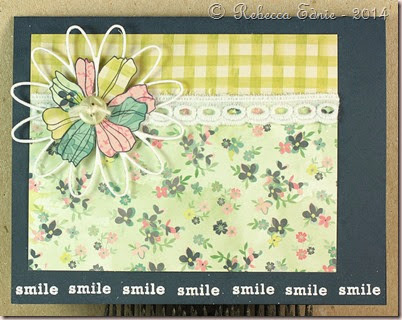 If you have lots of scraps, this is definitely the week to play. 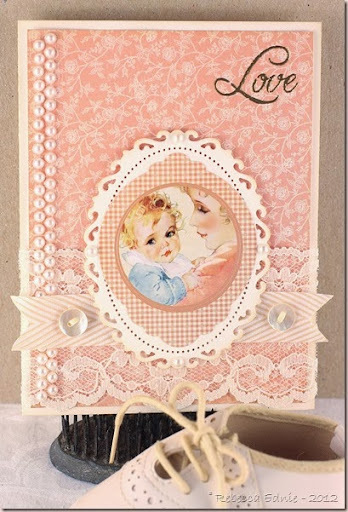 You can definitely add two squares or more together to show off more of a favourite paper or maybe add something else in a block like ribbon or a piece of fabric. Leaving a block empty near the edge makes for a cool look too! Can’t wait to see you there!